CEO Message - Complete Dewatering Systems Pvt. Ltd.
Large number of trained operators, supervisors and engineers. Experience of variety of projects over a period of more than 30 years. Large stock of Dewatering Equipment both diesel as well as electrically operated. 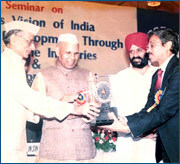 Received several awards from various Government and other institutions. Complete Dewatering Systems Pvt. Ltd. is the dedicated to providing "COMPLETE" dewatering Service to the Construction Industry. Our mission is to diversify and grow so that we can offer even more effective service to the growing demands of the industry. Our objective is to provide Solution and service that are unique in the industry, fully satisfying any needs and grow in a Positively creative enviroment. We will provide pumps, dewatering equipment and accessories of highest quality and will support their use with technical comprtence and prompt and satisfactory service. We will earn and maintain the reputation of being the most knowledgeable, reliable and customer supportive company in our industry and we will be good ambassadors to foreign market as we become global supplier of pumps, dewatering equipment and expertise. Global SME's Summit : The Minister of MIcro, Small and Midium Enterprises and Federation of Indian Chambers of Commerce & Industry Organized the Global SMEs Summit on 28-29 July 2009 at the Federation House, New Delhi. On this occasion Shri Dinesh Rai Secretary, Ministry of MSME was the Chief Guest. 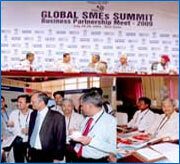 Anil Kumar Bisnoi Managing Director participated in the summit. 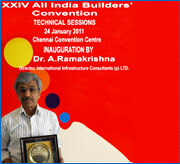 Seminar at Vigyan Bhawan : The 15th Annual Convention and Seminar of the Indian Building Congress was held at Vigyan Bhawan on 16th July 2009. 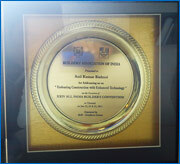 It was Inaugurated by Honble Sougata Roy, Union Minister of State for Urban Development. 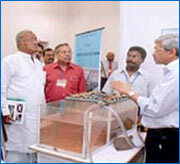 Here he is seeing the Working Model of Complete Dewatering systems Displayed at the Convention. 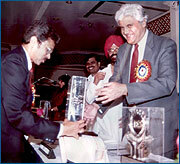 Mr. Anil Bisnoi, Managing Director, Complete Dewatering Systems Pvt. Ltd. is seen explaining the function of wellpoint Dewatering System to them.